Competent - but why not pick the V6 instead? With rising fuel prices, many are looking towards four-cylinder family cars that still have plenty of room, good refinement and the high equipment level they’ve come to expect. 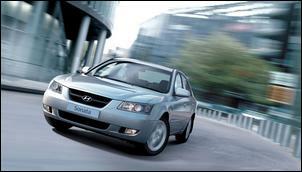 With apparently perfect timing, enter the 2.4-litre Hyundai Sonata Elite. The four cylinder has the same body as the previously tested V6 Sonata (see Hyundai Sonata V6), but exchanges the 3.3-litre 173kW engine for a 2.4-litre 118.5kW engine. You might guess the four cylinder would be much cheaper than the six, but in fact the difference isn’t great. Sticking to the models with auto transmissions, the base 2.4 Sonata is $26,990 and the base 3.3-litre model $29,990. The 2.4 Elite – the model tested here – increases the ask to $31,490, with the V6 Elite $34,490. Taking into account the fact that when you pick the four cylinder over the V6 you also downgrade the auto trans from a 5-speed to a 4-speed, lose the Electronic Stability Program and Traction Control systems and get smaller front and rear brakes, and the price difference looks even less significant. In fact, the only reason that we can see that you’d pick the 2.4 over the 3.3 is fuel economy. So, how much more parsimonious is the smaller engine? In as-tested auto-trans form, the four cylinder Sonata has an ADR 81/01 test cycle figure of 8.8 litres/100km, which is excellent in class. We recorded a test fuel economy of 9.2 litres/100 – quite close to the official test figure. But the V6 Sonata has a government test fuel economy of 10.1 litres/100km – and we actually did better than this in our test! 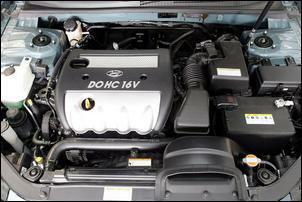 So the fuel economy of the smaller engine is only a little improved – but there’s a drop in power of nearly 32 per cent. Does that make the 2.4 Sonata a slug? Not at all. Despite having only the four-speed auto, the car gets up and goes well, helped by a strong bottom-end torque. If we didn’t have the memory of the V6 still fresh in our minds, we might have even thought the four had good performance. But while it’s quite adequate, it misses the unexpected silken punch of the fabulous six. The new ‘Theta’ engine (apparently to be licensed to DaimlerChrysler and Mitsubishi for some of their future models) also has a slightly throbby idle and lacks refinement at high revs. So for price, performance and equipment reasons, we think the V6 Sonata is definitely the pick over the four cylinder – whichever trim model you’re looking at. But what about the four cylinder car as a whole? How does that stack up? In short: very well. Inside, the Sonata is capacious – sure, not as big in every dimension as the local Falcons and Commodores but still with lots of room for four adults. Set the driver’s seat for a comfortable, tall person driving position and directly behind there’s still plenty of room in every direction, save perhaps for headroom if you’re very tall. And inside the cabin it’s not just a big volume. Intelligent design abounds, with plenty of storage spaces, a roof-mounted sunglasses holder, cup-holders in the fold-down rear armrest and in the centre console, a slide-forward central front armrest, and extendable sunvisors. The seats are comfortable and well shaped and the rear seat split-folds, allowing long objects to be carried. The boot volume itself is huge at 462 litres, although the opening is limited if box-shaped objects need to be placed inside. A 12V power socket is provided in the boot and the lid is hinged with gas-strut equipped external hinges that don’t intrude into the boot space when the lid is shut. The front seat head restraints are equipped with an active anti-whiplash mechanism which in a rear-end collision pivot the head restraint forward and slightly upward. In addition to height adjustment, the front head restraints can also be adjusted for fore-aft position. In-cabin equipment of the Elite includes an easy to operate climate control system, leather (which we found a bit sweaty), electric driver’s seat and an in-dash six-stacker CD complete with 8-inch sub and external amplifier. 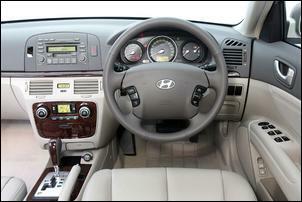 Standard on all Sonatas are a rake and reach-adjustable leather-trimmed steering wheel, six airbags, cruise control, ABS and a dashboard fuel economy display. Externally, the Elite adds reversing sensors, some chrome bits and pieces and 17-inch alloy wheels wearing larger 225/50 Dunlop Sport tyres. The ride is firm – although paradoxically we thought it was perhaps better with the larger wheels and tyres fitted to the four cylinder Elite than to the V6 base model – and the handling benign and competent. However, without stability control, once the four cylinder Sonata starts to understeer it will keep on doing just that – this isn’t a particularly balanced sporting car. More seriously, we also noticed quite severe steering kickback when the car was cornered hard on bumpy roads. In this story we’ve talked about the V6 model almost as much as the tested four cylinder car. But look at the figures: you pay about 10 per cent more for a car with 13 per cent poorer fuel economy – but which has 46 per cent more power, a 5-speed auto, Electronic Stability Control, bigger brakes and a much more refined engine. Even with fuel increasing in cost, to us there seems only one possible buyer decision.